June 25, 2013, Wisconsin DNR Ruffed grouse survey indicates slight population decline in the recently completed roadside survey of ruffed grouse. This survey has been conducted by staff from the DNR, U.S. Forest Service, tribal employees, numerous grouse enthusiasts and volunteers since 1964. Surveyors begin 30 minutes before sunrise and drive along established routes, making ten stops at assigned points and listening for four minutes for the distinctive “thump, thump, thump” sounds made by drumming male grouse. Results from this survey help DNR biologists monitor the cyclic population dynamics of ruffed grouse in the state. Regarding the slight increase in northern Wisconsin, Gary Zimmer, coordinating biologist for the Ruffed Grouse Society, points to the weather. “Weather, especially during the brood rearing period in late May and early June, plays an important role in ruffed grouse numbers,” said Zimmer. “The slight increase shown in this spring’s northern region drumming counts, even in a downward cycle, can definitely be tied to 2012’s excellent brood rearing conditions with its lengthy dry, warm period in June. “Unfortunately, this spring’s weather is not following the same pattern and it is doubtful fall grouse numbers will be comparable to last year in the north woods. However, even with lower populations, Wisconsin still has some of the best grouse hunting in the country,” Zimmer said. Treble Hooked Triple Beard Turkey: What?!? My good friend and hunting partner Jerry Cusick had one of the toughest spring turkey hunting seasons during this Wisconsin 2013 season. We all had some seriously tough weather to contend with but nothing like Jerry experienced so it is good he killed this unique gobbler. What I remember is it was downright cold that morning (First day of 3rd WI turkey season). I was bundled up pretty good and that was just barely warm enough. I was hunting above the river bluff on the edge of a picked corn field. There was gobbling in the dark before legal time, but nothing after fly-down. It was at least 2 hours later when I heard a faint gobble somewhere down the bluff. I called and he did not answer a hen yelp. I switched to deep drawn out gobbler yelps and he gobbled back. In my scouting the day before I found male turkeys still hanging out with other males, so I wasn’t surprised that it worked. It only took about ten minutes and he came up from below. I had a hen and jake decoy out and there was also a live jake that had walked in minutes before. The adult gobbler immediately went into strut and ambled towards the live jake until he moved off. The adult tom then turned and came right into my set-up. He never gobbled the whole time I watched him and he never broke out of strut either. I could hear him spit and drum clearly many times before I finally pulled the trigger at about 10 yards. 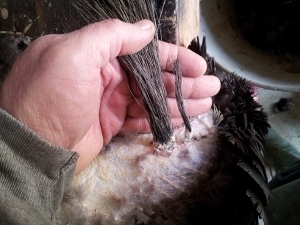 He had good spurs, a triple beard and the odd thing was the treble hook with swivel that I found imbedded in his waddle. I have no idea how he got it, but believe he may have tried to roost in a tree near the river where someone had lost their tackle up on a limb. photo and kill by Jerry Cusick. Triple bearded wild turkeys are rare but what was imbedded in the turkey’s neck is even rarer. 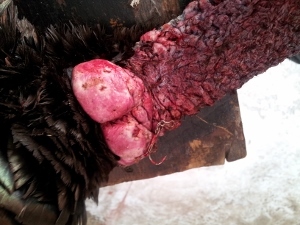 A Treble Hook in a wild turkey’s neck?! photo courtesy of Jerry Cusick. I have killed a lot of turkeys over the years many of them near rivers and streams that experience heavy fishing pressure but I have never seen a fish in a wild turkey. Nor have I ever heard of it happening before, ever. How is the world would a fish hook find its way into a wild turkey’s neck? Wow, I did not expect a unanimous vote. Is this what happens when special interest groups stand down? The Wisconsin Bowhunters who were the opposition lobbyists and the NRA who are the proponents of hunter freedom and choice agreed to not lobby for or against crossbill bill 194, the Senate’s version or the Governor’s signature. So the legislators were left to hear from their constituents without any group lobbying. This demonstrates that there is widespread support for crossbow hunting that cuts across party lines all across the state of Wisconsin. It will be interesting to see the how the Senate vote goes. Assuming this crossbow bill AB 194 becomes law in Wisconsin bow hunters will have a chance to try a crossbow while deer hunting for their first time. They’ll find there is a “crossbow” learning curve. Hunting with a crossbow is the same yet different than a regular bow. Many bow hunters have heard the stories and claims made about crossbows being so much easier than current legal archery, it will be interesting to talk with those first time hunters about their perceptions verses actual experience. I for one can’t wait. Under current law, the Department of Natural Resources (DNR) issues hunting licenses and establishes open hunting seasons that allow the hunting of specified game animals. Among the licenses that DNR issues are resident and nonresident archer hunting licenses. An archer hunting license allows the holder to hunt all game, except bear, elk, wolf, and wild turkey, with a bow and arrow during the relevant open season established by DNR. An archer hunting license allows a person to hunt only with a bow and arrow and not with a crossbow unless the person is disabled and holds a permit from DNR that authorizes the use of a crossbow or unless the person is at least 65 years old. 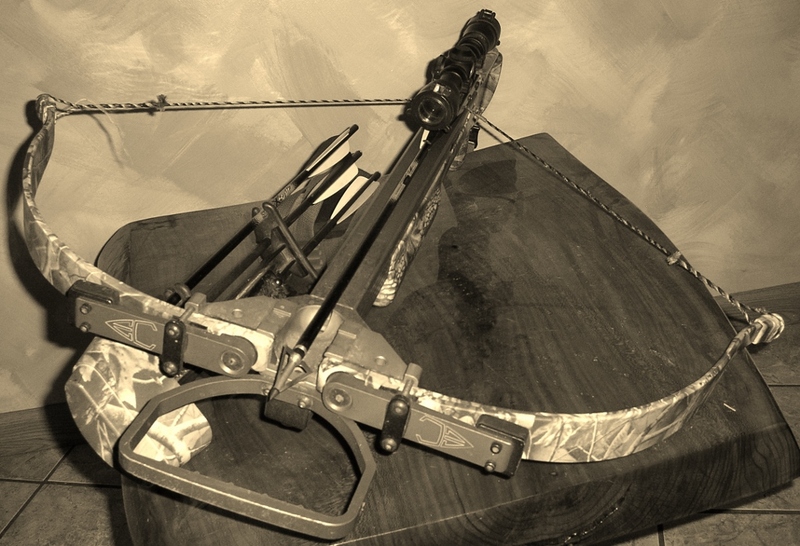 This substitute amendment eliminates the age and disability requirements for using a crossbow. Instead, the substitute amendment establishes a new resident crossbow hunting license and a new nonresident crossbow hunting license. The crossbow hunting licenses established in this substitute amendment allow a license holder to use a crossbow to hunt the same game animals that may be hunted under current law with an archer hunting license. The substitute amendment also allows the holder of an archer hunting license to obtain a crossbow hunting license at a substantially reduced fee and allows the holder of a crossbow hunting license to obtain an archer hunting license at a substantially reduced fee. As with other hunting licenses under current law, a person may not obtain a crossbow hunting license unless the person completes a course of instruction in hunter education or bow hunter education. Current law provides that if DNR establishes an open season for hunting deer, elk, small game, wild turkey, or bear with a bow and arrow but not with a firearm, DNR may not open that season for hunting with a crossbow unless the hunter is at least 65 years old or is disabled and holds a permit from DNR. This substitute amendment provides that if DNR establishes an open season for hunting any of those animals with a bow and arrow but not with a firearm, DNR must also establish a concurrent open season that allows a person to hunt the respective animal with a crossbow regardless of the age of the hunter or whether the hunter has a disability. The substitute amendment also provides that if DNR requires a person who kills an animal to register the animal with DNR, then DNR must make a record of the type of weapon that was used to kill the animal. Not all hunters stayed home during Wisconsin 2013 spring turkey season. Many of those who endured the historically cold and snowy weather were rewarded with gobblers. MADISON – Turkey hunters ran into poor hunting conditions during the first half of the spring turkey hunting season, resulting in a preliminary registration total of 37,804 turkeys, which according to Department of Natural Resources officials is an 11 percent decrease from the spring 2012 turkey season. Unseasonably cold weather persisted into May throughout the state, with deep snow in the north and rain, snow, and wind throughout the early season in the south. Colder than normal spring is causing to turkeys to feed in groups. According to Scott Walter, the poor weather likely reduced hunter effort and made harvesting a bird more challenging because gobblers were still tied to winter flocks of hens. “Hunters simply won’t spend as much time in the woods in inclement weather. The persistent winter weather therefore presented a double obstacle for hunters, and is the major reason we saw a drop in harvest and success,” said Walter. Zone 1 again produced the highest overall turkey harvest at 11,054 birds, followed by zones 3 and 2, where hunters registered 9,468 and 8,955 turkeys, respectively. The highest hunter success was in zone 2 with a preliminary success rate of 21 percent, followed by zones 1 and 3 at 18 percent, and zone 5 at 17 percent. Success rates were between 12 percent and 15 percent for zones 4, 6, and 7. Overall, the statewide success rate was 18 percent, compared with 21 percent last year. Though harvest was down, the number of permits issued for this year’s hunt increased by 5 percent, from 201,984 to 211,307. This season was the second spring turkey hunt in which hunters could register turkeys through phone-line or online registration systems, first introduced with the fall 2011 turkey hunt and in place for all future spring and fall turkey seasons. No in-person registration will be available. Although the recent severe winter may have proven challenging for turkeys, biologists note there is reason for optimism regarding this fall’s hunt. However, the prolonged winter may have resulted in localized mortality, especially in the north. A successful nesting and brood-rearing season propels turkey numbers upward. Generally speaking, dry conditions during June keep newly-hatched chicks from getting chilled and suffering from exposure, leading to good production in all upland game bird species, according to Walter. “Things have been wet so far this year during the nesting season. However, most turkey nests hatch around the first of June in Wisconsin. Dry weather over the next month will help those chicks survive the critical first few weeks,” said Walter. The fall 2013 wild turkey season will run from Sept. 14 through Nov. 21, with an extended season only in Turkey Management Zones 1 through 5, from Dec. 2 through Dec. 31. The deadline for applying for a fall permit through the lottery process is Aug. 1. Applications cost $3 and can be purchased through the Online Licensing Center, at license sales locations, or by calling toll-free 1-877-WI LICENSE (1-877-945-4263).